*** Wunderschöner Meerblick *** Für Langzeitmiete in diesem Herbst und Winter geöffnet !! Privatbesitz-Samstag bis Samstag Ferienwohnung. Buchen Sie direkt über den Besitzer! NEU September 2017-Wohnzimmer Couch, Liebe Sitz, Lederliege Stuhl, Matratzen & Deck Möbel !! KABELLOSES INTERNET!! Erbaut im Jahr 1997 (Es wurde gesagt, dass der Aufenthalt in unserem Haus der entspannendste Urlaub ist, den Sie jemals nehmen werden!) Schöne 3 Zi, Master = Königin, andere Schlafzimmer = 2 Einzelbetten, letztes Schlafzimmer = 2 Etagenbetten), 2. 5 Bath Home hat einen sehr offenen Wohnraum im Obergeschoss mit einer hohen Decke und vielen Fenstern, die meisten mit Meerblick. Komplette, moderne Küche mit allen Annehmlichkeiten, einschließlich Geschirrspüler und Mikrowelle. Kids Beach Spielzeug für Gäste. Riesige Wrap-around-Deck, mit Blick auf Ocean & Sound! 325 Yards vom Ozean! Alle Annehmlichkeiten des Hauses. 7 Meilen südlich des berühmten Cape Hatteras Leuchtturm.
! Hinweis: Sie müssen mindestens 25 Jahre alt oder älter sein, um dieses Haus zu buchen! In der Nähe von Fischerhäfen, Restaurants und Einkaufsmöglichkeiten! Einkaufsmöglichkeiten und Restaurants im Umkreis von 8 km. Sehr ruhige Sackgasse Straße zum Strand- Mit nur 5 Häusern. Everything was neat and tidy. Beach is beautiful. Quiet street. Perfect for short stay! Great beach combing finds! Mother Nature is amazing. Sunsets were so peaceful. Very enjoyable Thanksgiving getaway. Clean! Clean! Clean! This house provided all that we needed and more for our fishing vacation. Great location to Frisco beaches, walking distance plus vehicle ramp very close. Thank you very much for the review! 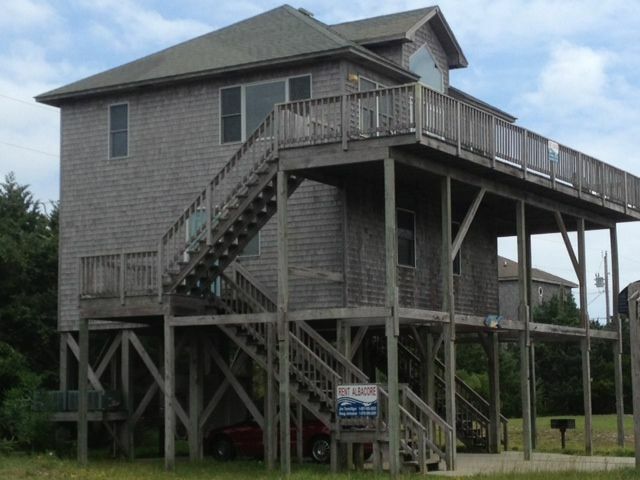 We are a family oriented beach house rental & love when families & fisherman enjoy our house! We really enjoyed our stay at the Albacore house. It was very nice. The house was the perfect size for our family. it was clean and decorated very Beachy. Wished we could have stayed longer. Jim Terwiliger was great to work with. Would definitely recommend house. just a short walk to beach. Great location, great value, owners were very responsive and helpful. Everything you could need in the kitchen and more. A real home away from home. Great comfortable house with everything needed to make your vacation enjoyable! Thank you Grayson for leaving the nice review! We appreciate you staying & look forward to having you back. We had an awesome time the house was great the weather we had was super hot and it was so nice to have the deck for sitting on especially at night. It was such a pleasure to have my children and 5 of my grandchildren there to spend the time with me. The house had all of the supplies anyone would need we didn't know so we brought so much stuff and if we had we could have brought so much less but it was so fully equipped with cooking items. Outer Banks, North Carolina. In zentraler Lage innerhalb von 15 Minuten vom Ferry & Ferry Plaza Shopping Center entfernt.! 15 Minuten. von Big Food Lion Grocery Store. Einige der besten Fischgründe & Windsurfen in den USA !! Sonstige Aktivitäten: Volle Größe Basketballkorb und Rückwand auf Beton Auffahrt. Viele Bücher, DVDs & Spiele! Attention Fisherman / Snow Birds, Special monthly Rate-$2200 per month! Discounted rates for renting for more than a week, call Jim for details!! There is a $80.00 Maintenance Fee Added for bookings of less than 7 Night.